Chad Spann explains the differences between a pass protection scheme with the Colts and his assignments at NIU. Photo by Mann00. Former Northern Illinois RB Chad Spann led college football with 22 touchdowns in 2010, but it didn’t get him drafted. No matter, Spann was a local star in Indianapolis and no team offered him a scholarship at his position and that didn’t deter him from finding a team that would give him a chance to prove his ability. This is exactly what the rookie free agent did this summer with his home town Colts, earning a spot with his play despite suffering a grade three hamstring tear that led to an injury settlement. To those uninitiated with the nuances of roster management, Spann simplifies the situation and states he’s been placed on Injured Reserve until he’s available. However, most football fans familiar with IR know that this designation wipes out a player’s entire season. An injury settlement allows the Colts to keep Spann on the team without going through the step of cutting him and then potentially losing him to another team before they can sign him to the practice squad. Spann is scheduled to be ready to rejoin the team in Week 8. If the Colts decide to cut him there are nearly a half-dozen teams that have indicated interest in signing him. Spann is one of those players I have the rare opportunity to speak with that is the complete package of skills, smarts, and toughness. There are first-round picks at his position who lack the self-assured confidence that Spann exudes without even trying, but it’s also mixed with a grounded sense of humor and generosity that makes him an enjoyable personality to talk to. After creating an interview series this summer where Spann and I watched one of his games together and he tutored me on the nuances of his position, Spann agreed to discuss his training camp and preseason experiences with the Colts. 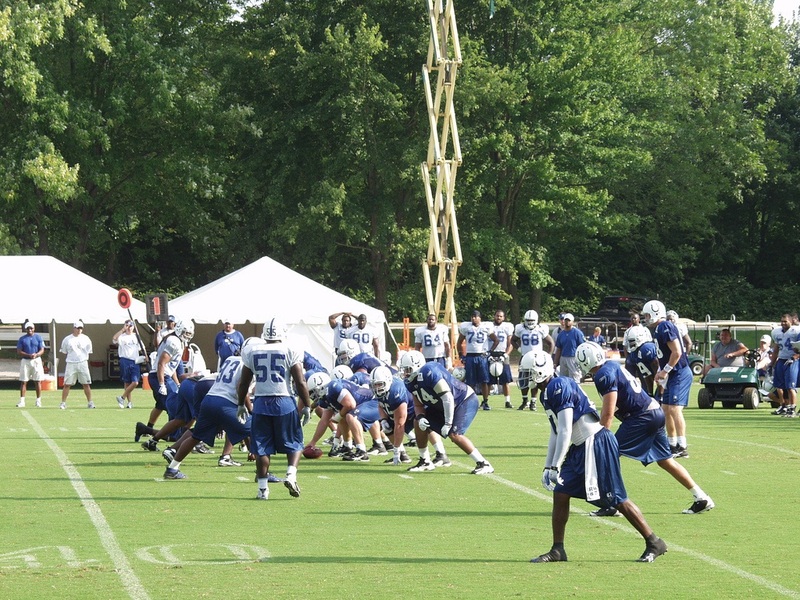 Part I details the differences between college football training camp and NFL training camp. Part II addresses the complexity of the Colts pass protection schemes, working with two other rookies at his position while also competing with them, and why what fans see on the field and what coaches see are often completely different. Waldman: What kinds of things did you learn about your position that were either new to you or further validation of what you’ve been taught in high school and college? Spann: Remember when we watched film together and did work on knowing all of the blocking schemes on running plays? It’s the same thing in the pass offense. In college it wasn’t that in-depth. We had a very simple protection scheme of man side and zone side where I had two responsibilities. If neither of those responsibilities blitzed then I would run a route from the backfield. 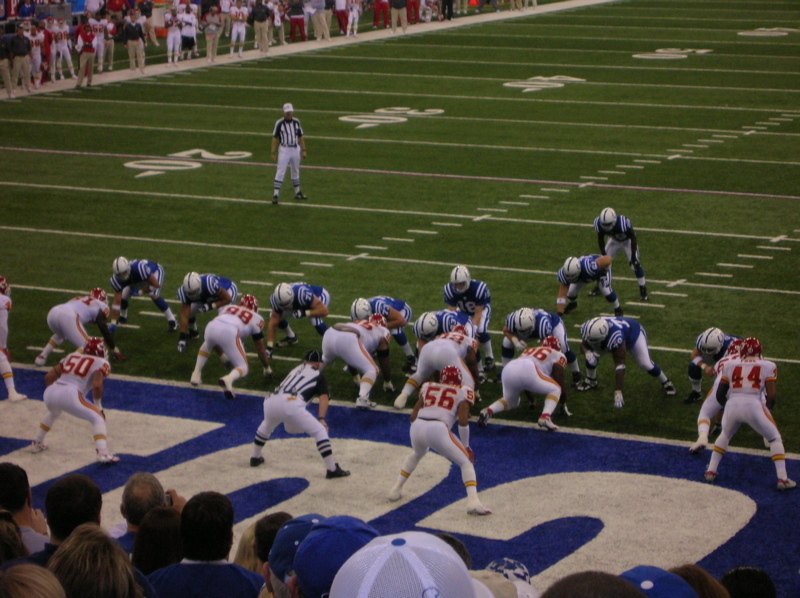 With the Colts offense their base protection have the running back checking at least three people – sometimes four people. It became very clear to me that I had to learn defensive fronts for sure and not just 3-4/4-3. I had to learn over/under and eight in the box because I had to know where these potential blitzes were coming from and I have to know which linebacker is going to be picked up by the offensive lineman and which one I have to pick up. Waldman: Can you give me an example? Spann: In a 4-3 defense in one of our standard protections the offensive linemen will pick up the four down linemen and the “Mike” LB – whoever they identify as the “Mike.” I may have the “Will” LB and Peyton has the “Sam”. This means I have to know where the “Will” is. But maybe Peyton looks at the defense and decides he doesn’t want to throw a hot route. He’ll change who the offense identifies as the “Sam” and identify him as the “Mike.” So now instead of the offense blocking the original “Mike,” they are going to block the player Peyton is now calling the “Mike” based on what he sees on the field. Colts rookie RB Chad Spann explains that the labels of linebackers on paper (Mike, Will, and Sam) change to what the quarterback wants them to be once the teams are on the field. Photo by Rumor Net Photo Gallery. Now I have to know that if the “Mike” moved over one spot then my “Will” moved over one spot. Now the original “Mike” linebacker is now the “Will” and that’s my guy to pick up. Waldman: When you think about watching game analysis on TV and the analyst is circling who he identifies as the “Mike” you have to hope that he knows this from talking with the coaches of that team because what you’re telling me is that the way linebackers are identified at the line of scrimmage changes not just according where they line up, but how the quarterback decides to label them to execute a play. Spann: That kind of stuff is up to the quarterback. Almost every route in a passing scheme as a built-in hot route. Sometimes Peyton doesn’t want you to cut off the route and run that hot route. Instead he wants you to run the full route. He’ll change who the “Mike” is so the other linebacker that was the free blitzer gets picked up by the offensive line and that puts me in a position to run my full route and do what Peyton wants us to do offensively. It was definitely an adjustment at first and took a little bit of time to pick it up, but once I did it made a whole lot of sense and made the game clearer to me. Waldman: What kind of pressure do you feel being a rookie, heading into a camp, and fighting for a job with guys like Delone Carter and Darren Evans – especially Evans, who you were friends with in high school? I didn’t even mention Donald Brown and Joseph Addai? Spann: It was kind of like going from high school to college. I was a walk-on when I came to college and ninth on the depth chart when I first got there. I had to focus and do the little things to get noticed and make an impact and that’s what I did with the Colts. I took the same approach going to Indianapolis. The thing that helped me in college that also helped me with the Colts is that I never played special teams going into college, but I knew I was a good athlete and I went all-out on special teams to make an impact. That’s what I did in Indianapolis and that’s what separated me from the other two runners. Yeah we can all run the ball well, but I definitely excelled on special teams. Not just kick returns, but coverage and punt blocking. It made a difference and it was the difference between me making the team and getting put on injured reserve and not making the team at all. Waldman: What kind of feedback did you get from the organization about your training camp and preseason performance? Spann: You don’t get a lot from the coaches, but talking to Chris Polian and Tom Telesco when I decided to take this injured reserve route they expressed how much they liked my game. They loved what I brought to the table and they didn’t want to lose me for the whole year and we took this injury settlement route so I could make it back to the club when I’m healthy. Delone Carter, Darren Evans, and I hung out the whole camp and helped each other and Delone expressed to me all the time that he likes the way I can catch the ball out of the backfield and make people miss. He said it was something he needed to work on with his game and he actually asked me for help in those situations. It surprised me because all the talk before the draft was that I couldn’t catch and I wouldn’t be that much help in the passing game (laughter). But seriously, one of my main attributes that appealed to the Colts was that I could catch the ball out of the backfield and line up at receiver and run routes and catch the ball. Peyton even described that as something he liked about my game. Waldman: What do you like about Darren and Delone’s games? Spann: They’re both bigger guys. Delone is my height but he’s 230 lbs. And Darren is about 6’1″ and almost 240 lbs. and they both can be physical backs. Darren is a straight, downhill guy without a whole lot of moves but great vision. And if you’re standing there in front of him he might run you over. He’s been that way since high school and I love that about his game. Now Delone like I said is my height but 230 lbs. and he has the ability to do the same things as Darren, but he has great balance and great feet. He’s not a blazer by any means, but he can make a couple people miss and get extra yardage. In the Green Bay game he made a couple of people miss with some nice cuts and got some extra yards. It’s not all about him being physical. He’s actually able to make people miss as well. Spann: Absolutely, I didn’t know how much I was going to play and my playing time came as a surprise to me. I got a few carries. My first broke for seven yards on a cut that I felt good about. My second carry I cut it back and ran a guy over to gain four yards and the first down. And the guy I ran over actually suffered a concussion so he was out for the rest of the game. Then the next play was a play action pass and they forgot about me in the flat. I caught it and earned a 25-yard gain and those three plays happened in a row. The next play was that play action pass for the touchdown and I think I definitely made an impact on sucking those linebackers down to the line of scrimmage because of my two big gains on the ground and the reception. Waldman: Now on the opposite end of the spectrum you folks on Twitter – me included – who over-analyzes everything they see in real-time. You had a couple of kick returns where you muffed the kick and there was a lot of commentary about those two plays. You had mentioned that you hadn’t played special teams since your freshman year. What did it feel like having to experience this part of the game when things go wrong? Spann: Man, it definitely hurts. I hadn’t returned kicks in a game since my senior year of high school, but a lot of people expressed that I had the ability to do it in the NFL. After catching the first one eight yards deep and took it to the 22 yard line I felt great. It was a great return and that was the opening kick off my first NFL game. It felt good getting thrown into the fire early. Later, I got a little complacent in the game and when they kicked the ball nine yards deep my coach made it clear that he wanted me to down the ball when it’s that deep. Knowing I wasn’t going to return it I relaxed and the ball went straight through my arms. I recovered it and got to the 10, but that was a mistake that could have been easily avoided. The second one looked bad on TV and I know all the bloggers and guys on Twitter are going to make a big deal out of it, but in the meeting rooms after the game the coaches told me that the second one I botched wasn’t my fault. My coach did not take that out on me. He explained to me it wasn’t my fault and the player in front of me was supposed to field that kick and when the offensive lineman on this squib kick moved away from the ball at the last second it caught me off guard. I didn’t get in trouble for that because it wasn’t my responsibility, but at the same time it looks like it was to everybody else and I’ll take that. I have no problem for taking the blame for that publicly if you hadn’t asked me specifically about it. But nobody in the meeting room felt it was my responsibility and it didn’t hurt my chances of making the team. Waldman: And that’s an interesting perspective we don’t get to see or hear about very often. I would think if they really thought it was your fault and you demonstrated repeated difficulty then you wouldn’t have lasted the entire preseason and training camp. Spann: No. And if that was a problem for me then they wouldn’t have kept allowing me to return the ball the entire game like they did. That was my third or fourth return that game and I returned the ball six times. It obviously wasn’t as big of deal to them as it might have appeared to everyone else on the outside. Waldman: Another reason that actions on the field speak louder than words. Tomorrow: Spann explains how he confounded Colts trainers by playing all but three minutes of a preseason game with what turned out to be (or progressively turned into) a grade three hamstring tear. Great stuff Matt. I hope he gets his opportunity. He signed with the Buccaneers practice squad this weekend. I hope so, too. He seems like a quality person and I like what I saw before I ever got a chance to speak with him. I read that this afternoon too. It’s got to be tough waiting on a shot. He was in London before he knew it. As we both know, it’s not all about talent…..the opportunity has to be there too. Hopefully, he’ll run with it. I look forward to your next piece. I absolutely love this kid and as a Bucs fan I couldn’t be more excited to have him. My only concern is that I know how much Chad wanted to be a Colt, having grown up there and been a fan his whole life. I hope he can find the motivation to give the Bucs 100% and completely buy into our team. I’m sure he has some disappointment right now that he is no longer a Colt, but he’s already got quite a following here in Tampa, so I really hope he gives us his best effort. He seems like a smart, high character kid that only knows how to work one way….hard. So I’m not too worried. Also, Kregg Lumpkin needs to give Chad #28. Blount & Spann!!! Go Bucs!